Don't be afraid to march out of step with everyone else if your instincts tell you it is right to do so. Remember that some people you may have once considered to be warriors may really have feet of clay. Behave with respect and dignity towards others as you pursue your own dreams. Learn how to work smart not hard - overworking is for the birds! Hi Everybody. I’m Tammy Strickland, a 2012 graduated Leaving Cert student in the Institute of Education in Dublin, and more recently, a graduate of Trinity College Dublin, where I was awarded a Bachelor of Science degree with first class honours. 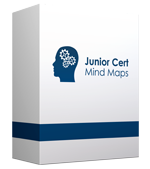 I have created this website, and its sister site www.LeavingCertMindMaps.ie, to share my personal study notes with other students who are facing the Junior Cert and Leaving Cert public examinations in Ireland. The slides above are from photographs my family and I have taken on our travels and the captions are little snippets of wisdom I have gleaned along the way. I hope you don’t mind me sharing them with you. Have you tried weekly grinds to get ahead of the pack or simply to keep up? Are you a junkie for all of the revision books published to help you “get it”, when all they seem to be is another text book covering the same material in almost the same depth of detail? Are you looking for revision notes for your Junior Cert that are logically structured and easy to remember? Get the grades without the grinds! Save money! Work smarter not harder! There is a simpler way to revise for your Junior Cert. I was lucky to learn about the power of Mind Mapping when I was still in primary school. Invented by Tony Buzan, who has written over 100 books on the topic, Mind Mapping is a system of note-taking that allows you to summarise a huge amount of detail on just a single page. So, when it comes to revision time, all I have to do is study my Mind Maps, not pages of handwritten notes and highlighted text in my school books. The beauty of this system is that it is all organised in a logical way. Therefore, it is a huge aid to your memory when trying to learn. Humans learn by association. Your associative memory can be represented on a single piece of paper as an information bubble at the centre of a page, with lots of other information bubbles leading out from the centre. Each bubble is linked by a wavy line.So what is so special about this? Well, from a study point of view you might have a chapter heading in the middle of a page surrounded by topics covered in the chapter. Moving out from each topic you might have some keywords or points that remind you of the detail contained in the chapter. It is all logically structured and easy to remember. I am now offering MindMaps in two separate formats instead of just one. Since I started sharing my notes with Junior Cert and Leaving Cert students a few years ago, I have been providing my MindMaps in PDF format. They are designed as an e-Book rather than for printing, although printing is also possible. I now offer them in MindGenius format as well, at no extra cost. So what is the difference between the two formats ? Some of the attributes of both versions are highlighted below. Different students will have different preferences and it is really up to them to decide between mobility and flexibility when choosing the version they want to use. The good news is that I will be supplying both versions for the cost of a single version from 1st July 2017, so you will no longer need to make a choice between versions. Yes, when you order you will automatically have both versions delivered to you for just the price of a single version. The MindMaps in PDF format allow students to view my content on almost any device, including mobile phones and tablet devices. The MindMaps can be viewed at any screen resolution you choose and therefore they are pretty flexible. However, because the MindMaps are very detailed, if you choose to print them it is better to print them on A3 paper rather than A4. In A4 format the print can appear quite small, particularly on really detailed MindMaps. The student or parent name gets locked into every MindMap in order to protect my copyright and there is no opportunity to add your own notes to the MindMaps unless you choose to do so in handwriting, which many students do as a matter of course. I also recommend using a highlighter on the various branches to allow information to be clearly segmented and memorised visually. When I created the MindMaps that I have been selling, I took my hand-drawn MindMaps and transferred the content into electronic format using a tool called MindGenius. I continue to do this today as I add new subjects to those already available. MindGenius is a tool for use predominantly on a PC or laptop and therefore it does not have the same multi-platform appeal as the PDF versions of my work. Unfortunately, MindGenius can not be installed on a Mac. However, MindGenius versions offer a number of advantages to users of my products. It is possible to open and close branches one at a time in the MindGenius versions so that you can concentrate on a single sub-topic at a time if you choose to do so. This is particularly useful for teachers that are using my MindMaps in class. From a printing perspective, you can print off individual MindMaps in multiple pages across and down so that you don’t need an A3 printer to get large blown-up MindMaps that you can join together and use as wall charts. You can also print off a single branch at a time on regular A4 paper if you need to. If you are looking for a good printer for printing your MindMaps in A3 or A4 sizes, I recommend Exaktaprint in Dun Laoghaire. The proprietor, Philip Maher, is a friend and he offers special rates for all of my customers. He will print, bind and deliver MindMaps anywhere in Ireland. Philip may be contacted on 01-284 4779 or by email exaktaprint@eircom.net. If you choose the MindGenius versions of the MindMaps, everything can be printed on A4 paper. You simply select what you want to print and it will facilitate printing multiple sheets of A4 paper both across and down. You can also select a single branch at a time to print. As is normal with purchases of all eBooks, we do not accept returns of electronic content (which is impossible) and therefore we do not issue refunds. The MindMaps are my own personal Junior Cert study notes and they are sold as is. No warranties in relation to the content are offered or implied. You may come across the occasional misspelling or typo and I apologise in advance for this. There isn’t one unless you think I should give away my work for free. I have spent more than two years creating these Mind Maps for myself and I continue to refine them even further so that you, the Junior Cert student, can benefit from my work. There are in excess of 700 Mind Maps in the entire set of 10 subjects. Priced at €9.95 per subject, they cost a fraction of the typical cost of your grinds or revision courses. Take a look at the sample mind maps in each subject and download examples for free from the page for that subject.